We know why your files have the .TRON extension appended and can no longer be opened – Autotron Ransomware has successfully infiltrated your computer. You might wonder how we know that this ransomware infection is the one responsible for locking your personal data when almost all ransomware infections encrypt files. The explanation is very simple - Autotron Ransomware is the only ransomware infection that uses the .TRON filename extension. It does not lock files on affected computers just for fun. Instead, it has been set to encrypt them so that its author could easier obtain money from users. Users are told after the encryption that they need to pay for the decryption service if they want their files back. Since this malicious application locks files in %LOCALAPPDATA%, %APPDATA%, %USERPROFILE%\Documents, %USERPROFILE%\Favorites, and %USERPROFILE%\Desktop, we are sure there are valuable files among those encrypted ones, but we still cannot let you send money to cyber criminals. First, you do not know whether your files will really be unlocked. Second, by sending money to malicious software developers, users encourage them not to stop creating new infections. In case your files stay encrypted, you will not get a refund, we can assure you. Specialists working at pcthreat.com have thoroughly analyzed Autotron Ransomware to find out how it works, and it has become clear that this infection locks various files, including documents, archives, music, videos, and much more. It does not lock all files with specific extensions. It searches for files whose size would be less than 15728640 bytes. You will soon find out which of your files have been encrypted because the ransomware infection marks all encrypted files with the .TRON extension. Once it finishes doing its job, it drops README.txt to C:\ProgramData and then copies it from there to %USERPROFILE%\Desktop, %LOCALAPPDATA%, %APPDATA%, C:\. D:\, E:\, F:\, and G:\. This file has been dropped on your computer to inform you about the whole situation. Users are, first of all, informed that their files are no longer accessible because they have been all encrypted. Then, they find out that they need to make a payment in Bitcoin to get those files unlocked. 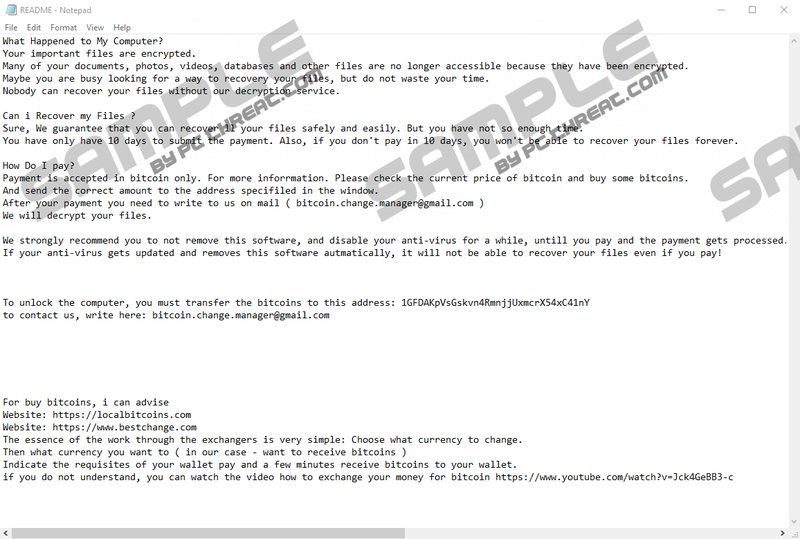 You can also find an email (bitcoin.change.manager@gmail.com) belonging to cyber criminals indicated in the ransom note, but do not bother writing them a letter because they will not unlock your files for free. It does not mean that there are no ways to restore files without the special tool. These affected files can all be restored from a backup. Unfortunately, there is nothing else you can do if you have never backed up your files. Ransomware infections are relatively sneaky malicious applications, so if you do not want to encounter crypto-malware, you cannot leave your computer unprotected. Specialists say that several different distribution methods might be used to spread ransomware infections, but they are mainly spread as malicious attachments in spam emails. Of course, users do not know that these attachments are malicious, so they open them themselves and, by doing this, give permission for the ransomware infection to enter their computers. In fact, users end up with malicious software after opening attachments spam emails hold quite often, so ignore all spam emails. Actually, you should be careful with emails that are not filtered to the Spam folder too because some of them, especially those sent to you by unknown senders, might be untrustworthy either. It is quite a tiresome job to ensure the system’s maximum protection, so we do not expect you to do the entire job alone. Instead, we want to encourage you to enable a reputable security application on your computer. There are a few removal steps you need to perform to delete Autotron Ransomware from your system, and we suggest that you erase this infection as soon as possible. First, you need to kill suspicious processes. Second, you need to delete recently downloaded files. Third, you should remove the ransom note from all directories. If you think that you can encounter Autotron Ransomware again, you should leave neton.pbk in %APPDATA%\Network and netq.pbk in %LOCALAPPDATA%\Microsoft\Windows. If this threat ever enters your system again, your files will stay untouched if these files are found. Unfortunately, your files will stay encrypted no matter you remove the ransomware infection or not. Open Task Manager by tapping Ctrl+Shift+Esc. Check all processes and kill those suspicious ones. Press Win+E to open Windows Explorer. Access %USERPROFILE%\Desktop, %USERPROFILE%\Downloads, and %TEMP%. Delete suspicious files from all these directories. Delete README.txt from %PROGRAMDATA%, %USERPPROFILE%\Desktop, %LOCALAPPDATA%, %APPDATA%, and C:\, D:\, E:\, F:\, and G:\ disks. Go to %APPDATA%\Network and remove neton.pbk. Quick & tested solution for Autotron Ransomware removal.